Each house is tastefully decorated and sleeps up to six people. There are 2 double bedrooms and 2 single (4ft double) bedrooms. Baby cot and high chair are available on request. These self catering cottages are located in a beautiful spot just 5 minutes walk to the fabulous blue flag beach. There is also a partial seaview from the living room window. Achill Island boasts some of the most spectacular scenery in the country, along with cosy pubs, excellent restaurants and exciting watersports. From Shannon : Take N18 to Clarinbridge via Ennis, N6 to Galway, N84 to Ballyhean via Ballinrobe, N5 to Castlebar, N59 to Mulrany, R319 to Keel via Achill Sound. From Dublin: N4 to Edgeworthstown, at Longford bypass roundabout take 2nd exit into bypass. N5 to Castlebar, N59 to Mulrany, R319 to Keel via Achill Sound. 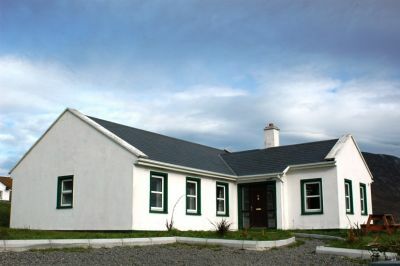 In Keel The houses are located on the right hand side of the road with the gateway at the side of the Achill Cliff House.